Bolivian Flag. Bolivia Officially has 2 National Flags. National Emblems. 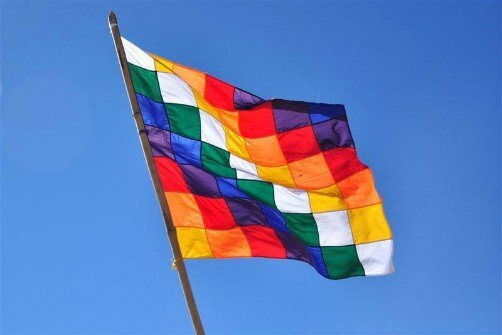 In 2009 President Evo Morales, who is of Aymara origin and the first indigenous president of Bolivia, declared that the the whipala, a checkered flag in rainbow colors, would be a new second official Bolivian flag and must be flown anywhere Bolivia's original official flag is flown, side by side. This set off much controversy among the general Bolivian population at the time. Why? Because the whipala is a flag that represents only the Andean peoples, the Quechua and the Aymara, and in a country that has 36 different native cultures and just changed its name from "Republic of Bolivia" to "Plurinational State of Bolivia" in order to ensure all of Bolivia's people feel equally represented, imposing the Andean culture on everyone else goes against the laws of the new Bolivian Constitution that was ratified in 2009 as well, a new constitution Morales himself insisted be re-written to ensure the equal inclusion of all Bolivian people. The Incan Empire was divided into four main regions (called suyus). 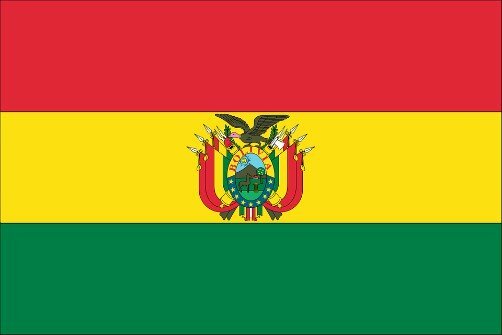 There are actually FOUR WHIPALAS IN BOLIVIA (the diagonal stripes of colored squares are arranged differently, depending on which SUYU, or region, the flag is meant to represent). In addition to the over 30 indigenous cultures that are native to Bolivia and still reside here, Bolivia is home to many other cultures. In fact, most Bolivians are not of purely indigenous origin. Of those who identify themselves as native peoples many are actually "mestizo" which means "mixed race", having Spanish blood or another ancestry, as occurs in many countries of the world. In addition, many large segments of the population are of North American, European, Asian or even African descent. Of Bolivia's total population, which is nearing 11 million in the country, only about 2 million identify themselves as Aymara. And finally, there are several million Bolivians living abroad, many of whom are of mixed race or ethnicity. Most of the population that is not of Andean descent was resistant to flying this new Bolivian flag and do not identify with it. They state that it does not represent them at all and feel that the Aymara are imposing their culture on them. As an example, it would be like passing a law that forces all people in the United States to fly the flag of Texas. This is punctuated by other similar laws and decrees that were being passed by Morales' government that have people who are not Aymara on edge, such as the fact that President Morales also declared that the Aymara New Year, celebrated on the 21st of June, will now be a national holiday and has ordered everyone to observe it. This means the country must shut down all activities and no one can work on this day. Companies that don't follow this order will be forced to pay their employees double salary for the day. Some argue that if the Aymara New Year is to be a national holiday then all 36 native cultures' New Years celebrations should be declared official national holidays too. Some say that instead of feeling more included, Bolivians who are not of Aymara origin are feeling more and more excluded, and imposing one culture's beliefs and traditions upon the rest of the population, such as with this new Bolivian flag, is causing division in the country rather than unity. In a country that has suffered from racial and cultural discrimination for centuries, there are those who argue that ordering everyone to fly this new second Bolivian flag promotes discrimination rather than abolishing it. Over the years, however, people have gotten accustomed to seeing the whipala, which by law, must be flown together with the Republic of Bolivia's flag at all official events.